What is carboxy CO2 gel mask pack? 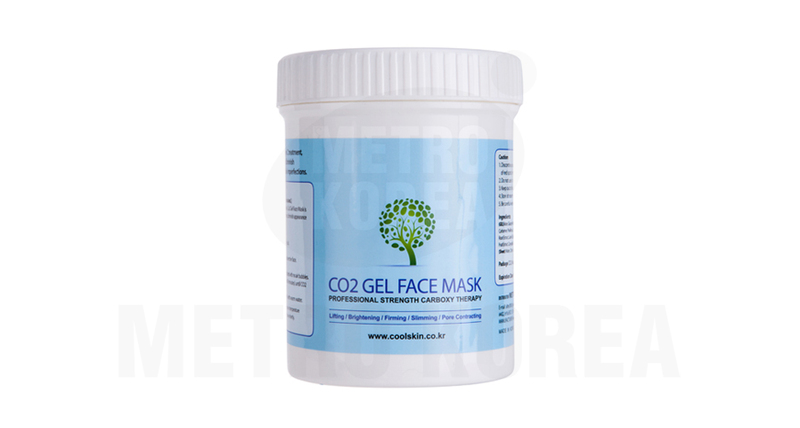 CO2 Gel was originally used for the treatment of wounds, but it was found that the gel has the effect to reduce the subcutaneous fat later, so that it can be applied to the use of shrinking the facial area. It is now being used for the skin care and the control of facial outline. 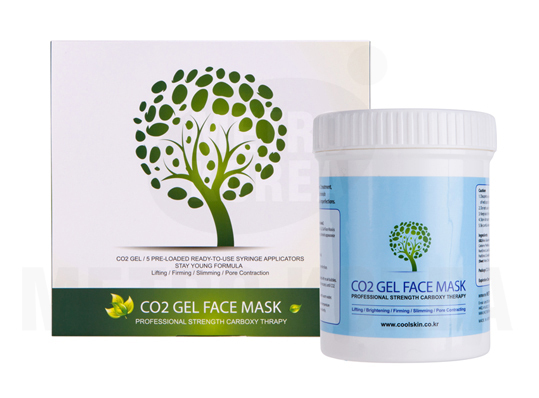 Carboxy CO2 Gel Mask pack is developed for the skin care of a facial area using this phenomenon, and it is simple and easy to use. You can enjoy the effect of the CO2 therapy conveniently at home without any pain of needles ordinarily being done at doctors’ offices. 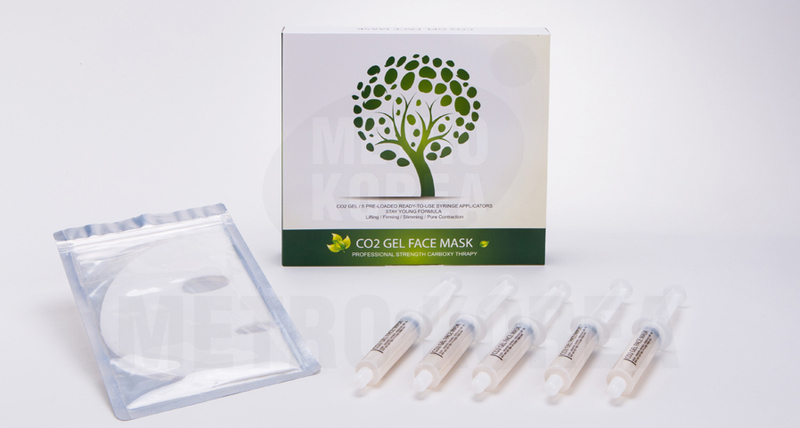 Carboxy CO2 Gel Mask pack consists of the gel and a mask, and it generates CO2 gas when the two make contact with each other. It is an efficient system of transferring CO2 into facial skin. Once absorbed into the skin, CO2 is known to induce Oxygen (O2) from the blood cells to skin tissues that causes vasodilatation, activates protein synthesis, promotes fat metabolism and discharge waste from the body. Bohr effect is known that the O2 concentration grows with the CO2 concentration so that O2 is induced to increase by the increase of CO2, resulting in more blood circulation and therefore improves regeneration of skin and reduces skin troubles. Gel should be used with full amount of a container so that the thicker layer of gel can generate enough CO2 gas with the mask. Make sure that the mask is in close contact with the skin, and keep it that way while CO2 is generated by tapping with fingers or hands. when blood circulation is enhanced, and soon it will be recovered in a few minutes after taking off the mask. Keep the product in a cool condition or refrigerated for the best result. Q: I get tingling sensation when I use CO2 mask pack. A: No worries. Such tingling sensation is just a normal reaction by the skin caused by displacement reaction of CO2 and oxygen. Q: I got reddening in the skin after using CO2 mask pack. Q: What is the recommended amount of CO2 gel to use at a time? A: Apply entire content in the syringe for one-time use. The thicker the CO2 layer, the better the better the result of CO2 penetration rate. Q: Will it increase the effect of CO2 mask pack if it is pressurized constantly? A: CO2 reaction is maximized when the mask is evenly and tightly attached to the skin. The CO2 reaction will be reactivated when you gently press down the mask after primary CO2 reaction is gone. A: Store at room temperature (15C ~25C), keep away from sunlight. When cold-stored, much greater skin soothing and cooling effect is expected. COPYRIGHT 2016 Metro Korea Co., Ltd. ALL RIGHT RESERVED.